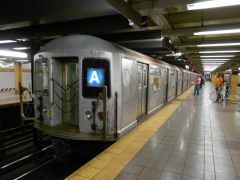 From 11:45 p.m. tomorrow (Friday, September 2) until 5:00 a.m. Sunday, September 4 (so, effectively, all day Saturday, September 3) there will be no service in either direction between Manhattan and Brooklyn on the 4/5 line (so no 4/5 service at Borough Hall) as 4 trains will be stopping and originating at Bowling Green in Manhattan, and 5 trains do not serve Brooklyn at night. Use 2 or 3 trains as an option. All other lines making local stops should be running normally through the Labor Day long weekend. Update: While the MTA has cancelled most service changes over the weekend because of Hermine, the cancellation of 4 train service from late tonight to early Sunday morning remains in effect. From 11:45 p.m. to 5:00 a.m. each night, Tuesday, September 6 to Friday, September 9, Manhattan bound A trains will be diverted to the F line between Jay Street-Metro Tech and West 4th Street. This means no Manhattan bound service at High Street during these hours, as C trains do not run late at night. To reach destinations in Manhattan below West 4th, use the 2, 4, or N, which replaces the R late at night. For planned service changes that may affect travel on other parts of the system, either during the weekend or the following week, see MTA Info or The Weekender.